You don't have to set up a backyard compost bin or pile to begin composting. 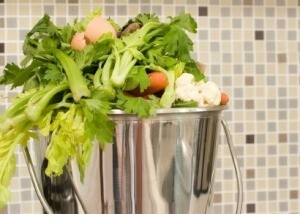 It is easy to compost on a small scale indoors, for example in a garage or basement. This is a guide about composting indoors. I enjoy reading the essays from ThriftyFun each week. Sometimes the ideas or tips are something I already knew (but needed to be reminded of), other times, it's a fabulous new idea for me to try. With all new ideas, I make a point to weigh the amount my time that they will cost against the benefits. Here is just one thing that I have been trying around my house this year: I started an indoor composting worm bin, which I keep in our basement. It sounds kind of gross, but for me the motivation was twofold: 1) to deal with the food waste our family generates in the winter without having to trek outside in the cold and 2) to have a steady supply of worms to feed our turtle (her "store-bought" food is $10 for a small container). Our solid waste management district educator (recyclejohnsoncounty.com) gave me a book called, "Worms Eat My Garbage" (you can find it on Amazon.com) to help me get started. It was pretty easy and cheap, only a Rubbermaid-type bin and some shredded newspapers to get started. I cleared out an area that was about 2 feet by 3 feet on a table in the corner of our basement that was out of the way. And, then the worms--you have to use a specific kind called red wigglers-- they had to be ordered on-line and were the most expensive part of the endeavor, about $25 for a pound. However, knowing what I know now, I would have put out a local request on Facebook or Craig's List, because folks who are using worm bins usually are willing to give some away to help you get started. Since they reproduce rapidly, it is possible to double your worms in a very short time. I am frequently asked if it smells bad to have all the rotting food in my basement. It actually doesn't smell at all. You just have to make sure you put plenty of newspaper shred in on top of your food waste each time you add more. If it does smell, that's just a sign that you aren't doing something right. I also found that the shredded paper could be from bills, statements, and junk mail, which made me feel like some use was being gotten from things I don't like to get in the mail. My turtle is eating what she likes best at no cost to me (after the initial purchase of worms are "paid off") and the food scraps don't require me going out in the cold anymore. Lastly, the worm by-product is an amazing plant food! The house plants are happy, full and green. As for our garden starts, this stuff is truly a miracle growing formula! A good tip for composting if you have trouble turning the compost pile or you don't have room for one is to put all of your kitchen peelings, left over vegetable leaves, and egg shells in the blender. Put in some water and grind to a pulp, add the coffee grounds. Then dig some holes in your garden and pour the whole bunch of glop it in. Cover with dirt and it will compost quickly in the garden. Q: I can't remember where it was at, but I have seen a place telling how to use a 2-liter bottle for making compost. Are there any other things that can be used indoors to make compost? What types of things do you put in it? I would like to make some for my house plants and for getting a garden started this spring. You can do this in the garage or basement if you have the room. All you need is a plastic garbage can (metal will rust). A 50 gallon can will give you the best results. Punch enough holes in the top and sides to allow oxygen to circulate through the compost materials. Collect "green" materials from your kitchen and store them in a gallon-sized ice cream pail or large coffee can (with lid) under your sink until full enough to add to the compost can. "Green" items include foods like coffee grounds, egg shells, vegetable and fruit peelings and other leftover food scraps. Don't compost meat or dairy leftovers as they will cause your bin to smell. Each time you add these "green" items to your compost can, follow with a layer of "browns." Browns are the ingredients that control odor. They include things like shredded leaves, newspaper, sawdust, or peat moss. If possible, also toss in a handful or two of topsoil. Make sure the bin stays slightly moist (add water if necessary)and stir it with a pitch fork or old broom handle once every two weeks or so. Another simple, but more time consuming method, is to compost using large freezer bags. Collect green ingredients the same way as above, and when the container under your sink is full, transfer scraps to a large freezer bag. Add brown ingredients until the bag is just half full and moisten everything with just a little bit of water. Double bag everything and date it before storing it in a warm location (like a heated porch or closet). In 6 months to 1 year, you should be able to use the oldest bags. You'll know the compost is ready if the contents looks and smells like soil. A bag opened too soon will stink! Another popular method of indoor composting is called vericomposting (composting with worms). If you're interested in learning more about this type of composting, there are many books and website on the subject, as well as an article about it on this site. If you have a yard or garden space I would not waste my time composting in a bottle. Dump the vegetable and fruit peels directly in the garden. Save a quantity of scraps in a small container, if you don't want to empty every day, and dump when full. Meats scraps are a no no. Most towns and villages have compost piles now days. Mine (thank you God) is right in my back yard and free! People take their grass clippings, leaves and tree branches there. The town mulches the branches and turns the soil, I go with my wagon or wheelbarrel and get it! Call your village or town to see if you have one, you might find one in a neighboring town if yours does not have one. Some charge but not much. I have gotten many plants from it that people have thrown out also. I also have one in my back yard where I put my food scraps. When I go to the village compost, I usually bring back some grass clippings, mulch or whatever and put it on my little compost. During the winter, I just dump the food scraps on my gardens that I think need it the most. Please remember to try to recycle anything you can. It saves landfill space and feeds your plants!